Golfers lost in translation at Los Angeles International Airport (LAX) may want to play a round -- and skip another one at the bar or lounge -- and shake off jet lag on the golf course or driving range. Westchester Golf Course sits just a 10-minute cab ride from LAX airport. If you have a multi-hour layover, there's almost always time to smack some range balls or squeeze in a quick round on courses nearly close enough to have their own terminal. That's especially true at Westchester Golf Course, a mere two miles (10-minute cab ride) from LAX. "We get a lot of people on layovers," said Sean Keller, the assistant general manager at Westchester. "We get more than other courses, and it's good for business since they buy tees, balls, a hat and rent clubs." Travelers checking golf bags through or who didn't bring clubs with them are in luck, as Westchester rents them inexpensively ($20 for a set of Tour Edge). And if you've got time to kill in the evening, the course is lighted until 10 p.m.; the course flips the switch at 5 a.m. on weekends for early birds. The par-64 course has recently been made whole after playing for nearly two decades with a funky 15-hole layout -- reportedly the only one in the U.S. 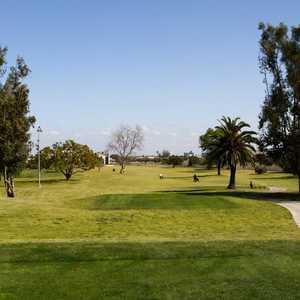 The airport authority, which owns the property, had carved out part of the course to create a freeway in the 1990s and finally ceded the land back to the course a few years ago. For $1.5 million, the 1960s-era neighborhood course added a new driving range and upgraded putting green as well as added three new holes, including the only par 5. The 515-yard 15th is a welcome addition visually and for a longer challenge. Keller told a recent visitor, "While you're playing that hole you'll see a plane land and another take off." Since the fairway is parallel to the runway, it appears that jets are almost heading for a green landing strip. The newly constructed par-4 17th hole also shows off well with its lush fairway and smooth green, while the ninth hole features the course's signature eucalyptus tree, which houses a family of hawks and splits the fairway approaches. Aside from that tree and a few bunkers, the course doesn't serve up too much trouble for most golfers. The legacy of Westchester's lost, and later found, property lives on in the current layout. It features a preponderance of par 3s (half of the holes). They are mostly of the 150-yard variety, but the opening hole plays just 108 yards. While it may be target practice for more skilled golfers, for $60 or less travelers can rent clubs, a cart and cover green fees instead of spending extra time at the terminal or hotel. And a recent round clocked in at just four hours, pretty brisk for city golf. When Westchester is crowded or peripatetic players prefer a longer, more challenging city layout they can take a cab ride to Chester Washington Golf Course. American Golf manages both of these county courses. Chester Washington officials say they get a fair amount of airport traffic, sometimes referred by their sister course, as traveling golfers and many visitors want to go the extra distance for the par-70 course. It plays 6,286 yards from the tips, and you can reach its greens from LAX in about 30 minutes. It's a little more generous for distaff duffers, playing to a 73 over 5,550 yards. The pro shop rents clubs for $35 a set, and there's a cafe and on-course snack bar (it takes credit cards, unlike L.A. muni courses). There's a range, chipping area and putting green, and lessons are available as well. Chester Washington's tree-lined terrain is hillier and more challenging than Westchester, with more bunkers to boot. The course has also been undergoing renovations this year, including reshaping the sand traps on the first five holes and filling them with new, fluffy sand. Additionally, some of the small, swift greens are being enlarged on the 61-year-old layout. The seventh and ninth holes are near mirror images of each other, driving over duck ponds from elevated tee boxes, second shots across the same steep ravine with Westward views over Elon Musk's SpaceX HQ next door and toward the ocean. You can't see the water from here. Jason Campbell, the pro shop manager, says there's an easy way to keep your bearings: "Everything breaks towards El Segundo, towards the airport, so follow the direction the planes land." Campbell also advises staying left on no. 5 and using a 5-wood or iron off the tee to avoid the right-hand side trouble -- a fairway bunker and a large tree obstructing greensward second shots. One last insider tip: Be sure you leave extra time for traffic and backups on the freeways (especially returning from Chester Washington in the afternoon) or you may be assessed a harsh penalty by your airline -- a missed flight and a pricey mulligan to get to your destination on the next departure. That could leave you feeling pretty rough as your bargain round of layover golf ends up costing you a lot more green.